The Dual Horizontal Articulating Arm Monitor Mount is ideal when you require two monitors in a side by side configuration. This monitor mounting solution is perfect for computer workstations or environments with limited desk space. The articulating arms give computer users the ability to adjust monitor height and distance for optimum comfort and well being. When the monitors are not in use, the user can fold the articulating arms back toward the pole which provides greater work space. Desk clamp model available only. The Dual Horizontal 100 Series Desk Stand is an expandable, modular, tool-less Freestanding monitor mounting solution which allows two monitors to be positioned in a seamless 'side-by-side' orientation. 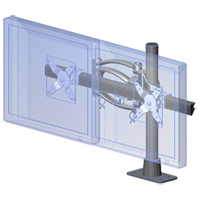 The 25" wide crossbar has 2 Standard Quick Release Pivots which are capable of tilting 20º up, 10º down and 25º left and right and accommodate monitors up to 24" (measured diagonally bezel to bezel). This allows the user sufficient range of movement to ensure monitors are in almost any desired position relative to each other in addition to the capability of rotating from portrait to landscape orientation. The pivots are VESA 75 and 100 compatible and can be adjusted along the crossbar. 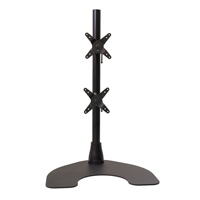 The heavy weighted 16" wide x 10" deep base and stand is 9 lbs and the vertical pole is 16". The Dual Vertical 100 Series Desk Stand is an expandable, modular, tool-less Freestanding monitor mounting solution which allows two monitors to be positioned in a seamless 'one-above-the-other' orientation. 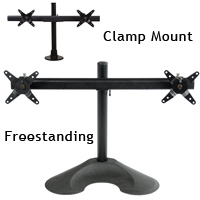 The 28" pole has 2 Standard Quick Release Pivots are capable of tilting 20º up, 10º down and 25º left and right and accommodate monitors up to 24"(measured diagonally bezel to bezel). This allows the user sufficient range of movement to ensure monitors are in almost any desired position relative to each other in addition to the capability of rotating from portrait to landscape orientation. The standard pivots are VESA 75 and 100 compatible and can be adjusted up and down the pole. The heavy weighted 16" wide x 10" deep base is 10 lbs and the vertical pole is 28". 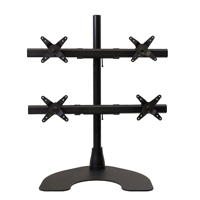 The Triple Horizontal 100 Series Desk Stand is an expandable, modular, tool-less freestanding monitor mounting solution which allows three monitors to be positioned in a seamless "side-by-side" orientation. The 25" wide crossbar with telescoping wings provides up to 5 extra inches of extension on each side of the crossbar, accommodating up to three 27" monitors (measured diagonally bezel to bezel). This unit has 2 Height Adjustable Quick Release Pivots which can be precisely adjusted up and down using a precision knob. Both these outer pivots and the central standard pivot are capable of tilting 20º up, 10º down and 25º left and right. This allows the user sufficient range of movement to ensure monitors are in almost any desired position relative to each other in addition to the capability of rotating from portrait to landscape orientation. All pivots are VESA 75 and 100 compatible and easily moved along the crossbar, or removed from the stand in seconds. The heavy weighted 18" wide x 16" deep heavy duty base is 29 lbs and the vertical pole is 16". 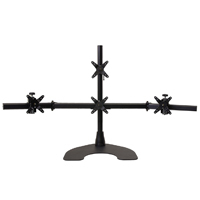 Le Triple Horizontal 100 Series Desk Stand est une solution sans outils pour supporter des moniteurs. Il est modulaire qui permet trois moniteurs d`être positionner dans une orientation côté à côté, aussi q` agrandis. La barre transversale de 25po de largeur avec des ailes télescopiques offre une extension supplémentaire de jusqu`à 5 pouces de chaque côté de la barre transversale, pouvant accueillir jusqu'à trois écrans de 27po (mesurés de diagonale du bezel à bezel). Ce modèle a 2 pivots Quick Release qui sont ajustables en hauteur, ce qui les permet d`être ajustés avec précision à l’aide d’un bouton. Ces deux pivots extérieurs et le pivot central peuvent basculer de 20º en haut, de 10º en bas et de 25º à gauche et à droite. Cela permet à l'utilisateur une amplitude de mouvement suffisante pour s'assurer que les moniteurs se trouvent dans quelle que soit la position souhaitée les uns par rapport aux autres, en plus de la possibilité de pivoter de l'orientation portrait à l'orientation paysage. Tous les pivots sont compatibles VESA 75 et 100 et se déplacent facilement le long de la barre transversale ou peuvent être enlever facilement. La base robuste et lourde de 18po de largeur x 16po de profondeur pèse 29 livres et le poteau vertical mesure 16po. The Quad "2 Over 2" 100 Series Desk Stand is an expandable, modular, tool-less Freestanding monitor mounting solution which allows four monitors to be positioned in a seamless 'grid' or 'square' orientation. Each row has a 25" wide crossbar accommodating up to two 24" monitors (measured diagonally bezel to bezel). This unit has 4 Sstandard Quick Release Pivots which are capable of tilting 20º up, 10º down and 25º left and right. This allows the user sufficient range of movement to ensure monitors are in almost any desired position relative to each other in addition to the capability of rotating from portrait to landscape orientation. The pivots are VESA 75 and 100 compatible and can be moved along the crossbar, or removed from the stand in seconds. The heavy weighted 18" wide x 16" deep Heavy Duty base is 29 lbs and the vertical pole is 28". The Quad "1 Over 3" 100 Series Desk Stand is an expandable, modular, tool-less Freestanding monitor mounting solution which allows four monitors to be positioned in a seamless 'side-by-side' orientation and a single monitor above the middle monitor. The 25" wide crossbar provides up to 5 extra inches of extension on each side of the crossbar, accommodating up to three 24" monitors (measured diagonally bezel to bezel). This unit has 2 Height Adjustable Quick Release Pivots which can be precisely adjusted up and down using a precision knob. Both these outer pivots and the 2 central Standard Quick Release Pivots are capable of tilting 20º up, 10º down and 25º left and right. This allows the user sufficient range of movement to ensure monitors are in almost any desired position relative to each other in addition to the capability of rotating from portrait to landscape orientation. All pivots are VESA 75 and 100 compatible and easily moved along the crossbar, or removed from the stand in seconds. The heavy weighted 18" wide x 16" deep Heavy Duty base is 29 lbs and the vertical pole is 28". The Hex "3 Over 3" 100 Series Desk Stand is an expandable, modular, tool-less Freestanding monitor mounting solution which allows six monitors to be positioned in a seamless rectangular orientation. Each row has a 25" wide crossbar with wings accommodating up to three 24" monitors (measured diagonally bezel to bezel). This unit has 4 Height Adjustable Quick Release Pivots which can be precisely adjusted up and down using a precision knob. Both these outer pivots and the 2 central standard pivots are capable of tilting 20º up, 10º down and 25º left and right. This allows the user sufficient range of movement to ensure monitors are in almost any desired position relative to each other in addition to the capability of rotating from portrait to landscape orientation. All pivots are VESA 75 and 100 compatible and easily moved along the crossbar, or removed from the stand in seconds. The heavy weighted 18" wide x 16" deep Heavy Duty base is 29 lbs and the vertical pole is 28". 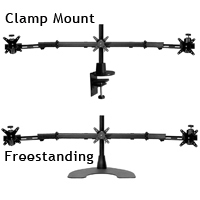 The Single Articulating Arm Monitor Mount (16" Pole) is ideal when you require just one monitor and the option to expand. This monitor mounting solution is perfect for computer workstations or environments with limited desk space. 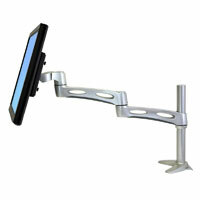 The articulating arm gives computer users the ability to adjust monitor height and distance for optimum comfort and well being. When the monitor is not in use, the user can fold the articulating arm back toward the pole which provides greater work space. Desk clamp model available only. 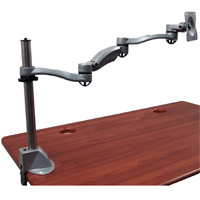 The Neo-Flex Extend LCD Arm from Ergotron offers a full 9.5" of height adjustment and can be used to position the middle of the monitor anywhere from 9" to almost 18.5" above the mounting point. At maximum extension from the mount it can also reach a full 23". This is a pole-mount arm that requires manual adjustment along the 12" upright. The Extend LCD Arm is also modular which means that where space is limited it is possible to remove one or both of the extensions to reduce the extension reach. However, this is accomplished with an accompanying loss of both articulation range and elevation. Since the complete arm folds back to under 5" there really is no need to remove the extensions. Weight capacity is from 7 to 20 lbs. 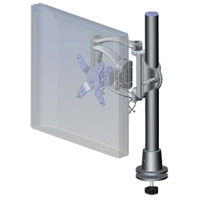 The Concerto Extended Reach Pole Mount Monitor Arm from KV Waterloo is a stylish, easy-to-install pole-style monitor arm that offers monitor elevations up to 22.5" above the mounting point. 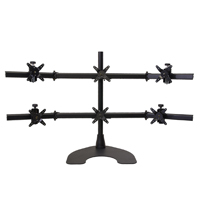 The quadruple-jointed articulating extension arm freely swivels about the base 360°, with the triple extensions allowing forward movement up to 29" from the mount while still folding back to just 5" deep. The 18" pole provides 12.75" of height adjustment as needed and one section of the extension provides 6" of spring-loaded height adjustment from any position. This arm is equipped for both desk clamp and grommet hole installation. This unit also comes with cable management to keep cables neat, and fits monitors complying with VESA 75mm and 100mm hole patterns. Note: WE ARE UNABLE TO OFFER A 30 DAY CUSTOMER SATISFACTION GUARANTEE OR WARRANTY ON THIS PRODUCT.